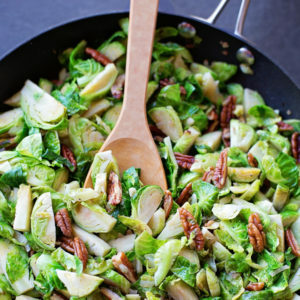 These maple pecan Brussels sprouts make a perfect side dish for holiday dinners. They're sautéed to perfection and tossed with pure maple extract and toasted pecans. Cut the sprouts in half lengthwise, then cut into ribbons (about 4 cuts per sprout). In a large skillet, heat olive oil over medium-high heat. Add the shallot and garlic, cook until tender and fragrant. Add the Brussels sprouts and cook until tender, about 6 minutes. Drizzle the maple syrup over top and sprinkle in pecans (and bacon). Continue cooking for 2 minutes, then season with salt and pepper, serve immediately. -Bacon is totally optional but makes a great addition to these sauteed sprouts. -To toast pecans, simply place a large skillet over medium heat and add the pecans. Cook for 10-15 minutes or until the nuts are fragrant and begin to darken, but not burn. You will need to toss them a every 5 minutes or so.